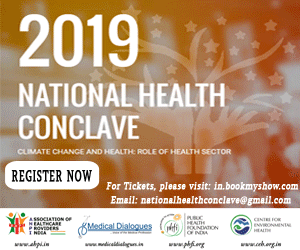 New Delhi: In a first of its kind endeavour to promote create awareness about climate change and its impact on Health, Association of Healthcare Providers of India (AHPI) in association with the Public Health Foundation of India (PHFI) is going to organize National Health Conclave on Global Climate Change and its impact on 23rd March 2019 in New Delhi. Global climate change is an emerging threat to public health. India is amongst the countries who are most susceptible to global climate change as it has seen immense growth in industrialization which has resulted in increased pollution. Climate change has not only impacted health but has also impacted the agro-industry. Keeping in mind the harardous effects of climate change, the Conclave is going to address the role of health sectors in combating health complications due to climate change in India, along with outcomes of global climate change in the health and socio-economic status of the country. The conclave will begin from 09:00 am and will continue till 3:30 pm. Eminent figures like Dr. Poornima Prabhakaran – Deputy Director, CEH, PHFI, and Dr. Girdhar J. Gyani as esteemed speakers of the conclave are going to discuss the issue and what steps could be taken by the country in the coming days. This will be followed by a live performance by Grammy Award Winner Ricky Kej. Inter-sectoral approach to mitigation – perspectives from policymakers, academics, providers, and industry.